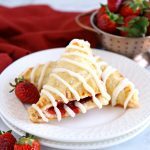 These Easy Strawberry Hand Pies are the perfect homemade pastry treat that's great for dessert, brunch, or a snack. They taste just like Toaster Strudel!! Add the sliced strawberries, sugar and cornstarch to a pot and stir together while cold. Turn the heat to medium and cook until the mixture is bubbly. Mash the strawberries a little bit with a fork and set aside to cool. Preheat your oven to 350 degrees Fahrenheit and prepare a large baking sheet, lining it with parchment paper. Roll out the cold, but thawed, puff pastry sheet and cut into 6 large squares. Add a dollop of the strawberry filling in the middle of each square and brush the edges of each square with a little bit of water. Fold each square over to form a large triangle and crimp the edges of the triangle with a fork. Combine the egg and water with a fork and brush the tops of the hand pies with this mixture. Transfer the hand pies to the prepared baking sheet lined with parchment paper and bake for 22-25 minutes, or until golden brown. While the hand pies are cooling completely to room temperature, add the powdered sugar to a bowl and add the water 1/2 teaspoon at a time just until a thick, drizzle-able glaze forms. The amount of water will vary depending on the brand of powdered sugar you're using - watch carefully! Add the glaze to a small zip-loc bag, snip off the corner, and drizzle the glaze over the hand pies once they've cooled completely. Enjoy immediately or store in at airtight container for up to 2 days.